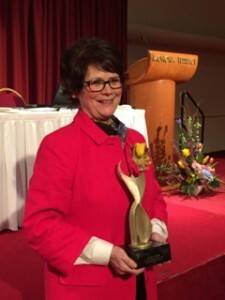 Ellen Foley accepts the 2015 Athena Award in Madison, Wi. None of the 10 nominees at this week’s Athena Awards Dinner in Madison, Wi. knew whether we would be the one chosen for this year’s top award. But all of us were encouraged to prepare remarks. It never occurred to me that I would be chosen but I thought if I wasn’t, this would be a good post for this blog. I wanted all the people in my life to know how much I appreciate their support. Following is my little speech upon becoming a goddess. As the young people in my office would say: THIS IS AWESOME! There are 10 winners here tonight. Nine of them are sitting the audience. I know most of them rather well. I am humbled and grateful to just be in the same room with you, fellow nominees. 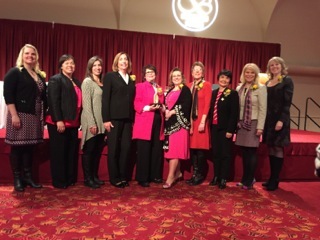 All 10 nominees were winners at the 2015 Athena Awards. From left, Stacy Shropshire, Renee Moe, Mary Landry, Anita Matcha, Ellen Foley, Becky Branton-Griemann, Andrea Kaminski, Sue Jiang, Kim Sponem and Shannon Barry. Thank you to the Business Forum and its Athena Committee for this honor, especially Jen Gregor. Thank you to my husband, Tom, who somehow puts up with all my running around and makes me laugh every day. Thank you to Melissa Girton, my hair stylist, who made me look this good tonight. I even look like my LinkedIn photo! It will astonish some of you to know I don’t generally look like this on a Tuesday night. Thank you to Michelle Downer, Tami Gilbertson, Elena Colorez, Stephanie Tervort and Kim Goke and all my WPS friends for organizing this night. Thank you to my friends, Donna Beestman and Linda Brei, who are here with us tonight. They stuck by me when I was down and out, especially during my husband’s long illness. 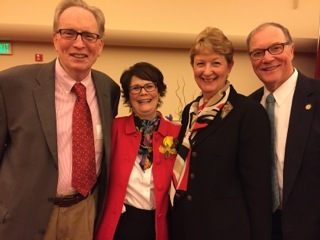 Donna and George Beestman celebrate with Ellen and Tom Foley at the 2015 Athena Awards. Thank you to Mike Hamerlik, my boss, for hiring me at WPS two years ago and thank you to Beth Hamerlik for putting up with all of us at WPS, especially Mike. Finally, thank you to Rachel Rasmussen, who nominated me for the Athena Award. Some of you know that I emailed Rachel months ago when I saw the list of honorees and volunteered to pull out of the competition. I told her that the Business Forum had chosen 10 of Madison’s superstars and maybe the Business Forum should sprinkle us out over the next 10 years. The Business Forum declined my suggestion! And here I am. Now let me tell you about Rachel because that will give you some detail about why this is such a unique honor for me. I love lunch. If I had a dime for every time I said “Let’s have lunch,” Tom and I would be living in a big house on the lake. A few weeks after that conversation, Rachel arranged lunch on her dime at the Madison Club, which she had recently joined. I remember she was very proud to be taking a friend to the Madison club because her membership was a sign that her business was flourishing. It was extremely charming. The lunch started a friendship that lasted many years and is at the heart of my DEEPEST appreciation to the Business Forum tonight. Rachel, like so many of you in this audience, values me not because of what I can do for her but for who I am. For Rachel, I am a mentor whom she can email, call, meet for coffee, Facebook, message —-just to talk about whatever is on her mind. I am not a hot sales lead or a reference for a job. I am just Ellen. Our years long conversation covered her challenges in her then-startup business — now in its seventh year —, her wedding to the wonderful Ron, and our mutual love of writing and publishing. Rachel is one of about 20 younger people, mostly women, in Madison whom I informally mentor — offering my friendship in return for theirs. Some of them do want a job reference. And that’s ok. But Rachel taught me how to turn them into pals and how to let them mentor me back. Thank you, Rachel. I thank all of you here tonight for honoring me in the way all human beings want to be recognized. Tonight I am not the editor of the State Journal, or an executive at one of city’s largest employers or a civic leader. Tonight I am just Ellen, friend of Rachel. And THAT is truly AWESOME. 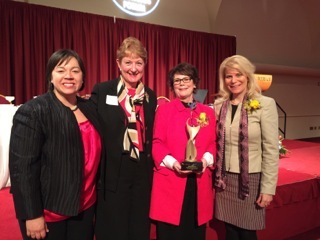 Athena goddesses, from left, Renee Moe, Donna Beestman, Ellen Foley and Kim Sponem at the 2015 Athena Awards.